Free ListingsSubmit your business listing or recipe for FREE! 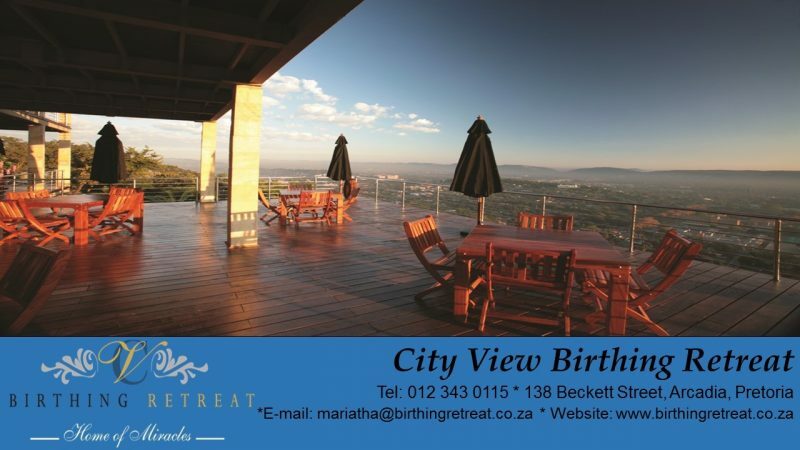 City View Natural Birth Birthing Retreat – Arcadia Pretoria. This freestanding birthing centre retreat focuses on pregnancy, childbirth and early parenting for those couples who prefer a less institutionalised setting than a hospital. We are staffed with advanced midwives and doulas for women who wish to deliver naturally. City View Birthing Retreat is located near the Steve Biko Academic Hospital and other private hospitals. Five spacious, luxurious themed rooms each with a fantastic view, wi-fi internet and television. Support and education to prepare couples for pregnancy, birth and parenthood. An independant practice for women who wish to deliver naturally, assisted by midwives and doulas. Pregnancy, childbirth and early parenthood conferences – seating arrangements banquet style, cinema style or schoolroom style. Providing training courses for midwives and doulas.